Halloween treats should be scary and spooky. 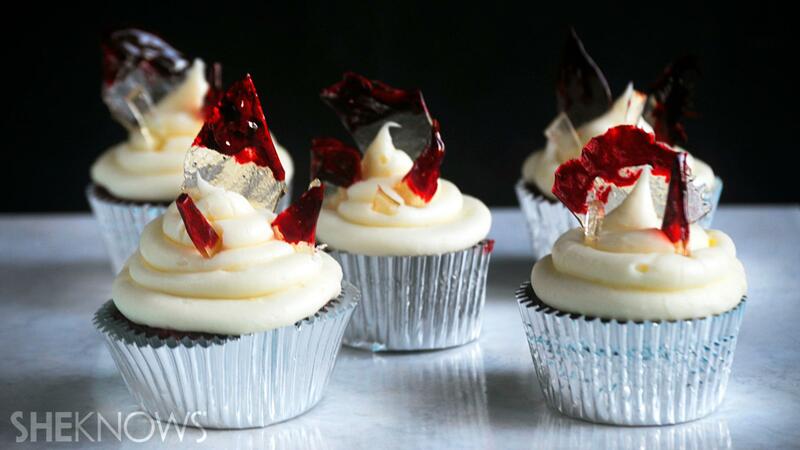 These broken glass red velvet cupcakes fit the bill perfectly! t The best Halloween treats are the ones that scare the pants off you. Yes, the holiday can be fun, whimsical and playful. But Halloween should mostly be scary, spooky, eerie. The food should be a reflection of that eeriness. Punch bowls filled with lychee eyeballs or cheesy burnt mummy hands always make an appearance. This year, change it up a little bit and serve up these broken glass cupcakes. t We’ve been calling them “The Dexter,” reminiscent of that wily serial killer and his blood slides. In reality, they are simply a moist red velvet cupcake topped with a luscious cream cheese frosting and some cracked sugar. But in the Halloween world, they are oozing with creepy blood from shattered shards of glass. t The method is simple here. Bake up and ice your cupcakes as usual. Then create the sugar. It’s easy, just combining a few ingredients in a pan until hard ball stage, then spreading it on a parchment-lined sheet to harden. Once that sugar is hard, break it up into pieces and dip them into some red food dye. Arrange them on the cupcakes and you’ve got a creepy treat worthy of any Halloween party. t Note: We used gel food dye which is very concentrated and gives off a serious red color. The longer the cupcakes sit, the more the “blood” bleeds. It will start to bleed into the icing and gives it a scarier look. Begin by making the glass. Lay parchment on a baking sheet. In a saucepan, combine sugar, corn syrup and water. Heat to 310 degrees F (hard ball stage). Once it hits this stage, work quickly. Use a spoon and carefully spoon some of the mixture onto your parchment. Repeat until you have 6 to 10 sugar spots on your parchment. You will most likely have some sugar mixture left over; use it for candy apples. Set the trays aside to harden while you make and assemble your cupcakes. Prepare the cupcakes. Preheat the oven to 375 degrees F and line a muffin tin with paper liners. In the bowl of a mixer, combine butter and sugar until fluffy. Add in the egg and mix well. Stir in cocoa powder, vanilla and liquid food coloring until well mixed and no streaks remain. Stir in buttermilk. Add in flour and mix slowly until well combined. Add in baking soda and vinegar and mix until combined. Use a cookie scoop to put the mixture into the muffin tins, 3/4 to the top. Bake for 15 to 20 minutes until a toothpick comes out clean. Set aside to cool completely on a baking rack. They must be completely cooled before icing. To prepare the icing, combine butter and cream cheese in a stand mixer and beat until well mixed. Slowly add in the powdered sugar, a cup at a time, until thoroughly mixed. Add in cream or milk a tablespoon at a time to thin the icing, if necessary. Transfer to a piping bag fitted with a round tip. Pipe on to the cupcakes. To prepare the glass, simply use your fingers to break the hardened sugar into shards. Dip the ends of the sugar into some red food dye, then place the clear end into the icing of the cupcake. The icing will be thick and will hold the glass up. Repeat until you have no more glass.